Bloggers are now attracting the attention of marketing giants like never before. Brands want them to come and see their products, write about them and give feedback. I see a good trend emerging as this could be a useful link between the consumer and the brand. The bloggers themselves are consumers, they use products and do some reviews and general expression of opinions on most products they use. Like I use a certain brand of organic cooking oils and like it so I mention it now and then in my blog posts. But when we are invited for an event where a brand showcases their product we have to be careful in what we see and tell our readers. Or make an opinion for ourselves. After all, the brands make it look like a grand product when they have control over the showcase. More and more brands are becoming aware of the blogs power of influencing their readers. There are numerous fitness blogs motivating people to get fitter, Fashion blogs with apt advice, beauty and make up blogs, lifestyle blogs and all of them are influencing, motivating and inspiring a lot of their readers. For marketers, there is a lot to tap in this connect of blogs and it's readers. For us bloggers too, there certainly are a lot of products we would like to know about, as we keep getting queries regarding kitchen gadgets and their working, myself being a food blogger. So I take interest in whatever the brands have to say about their product. after all we all keep looking for better and better kitchen gadgets to work with. Be it a spatula or a microwave oven. This is the reason I got curious about this event by Philips called Foodathon and my interest grew when I got to know that Chef at Large is a consulting partner. Reached dot on time and found Sid Khullar in a chirpy mood. Was happy to know that he would be addressing us bloggers at the event. Very soon I saw that Hemant Sud, the ace photographer arrived as well. I had heard him talking photography earlier, so that was another plus point for me. Met Ipshita Chakladar of Ipshita's cakes mama bakes and Anamitra Chakladar and had a lovely chat with them. The event was actually planned very well. The bloggers were scheduled to learn a lot from the masters. Sid Khullar spoke about blogs and how we connect and learn through blogs and earn through them too. His opinion is always valuable for a blogger. Hemant Sud was again a store house of information for a food photographer and Chef Darren Conole spoke about plating the food, it's elements and colors etc. The aesthetics in food presentation. The things planned in this even were really a blogger's delight. 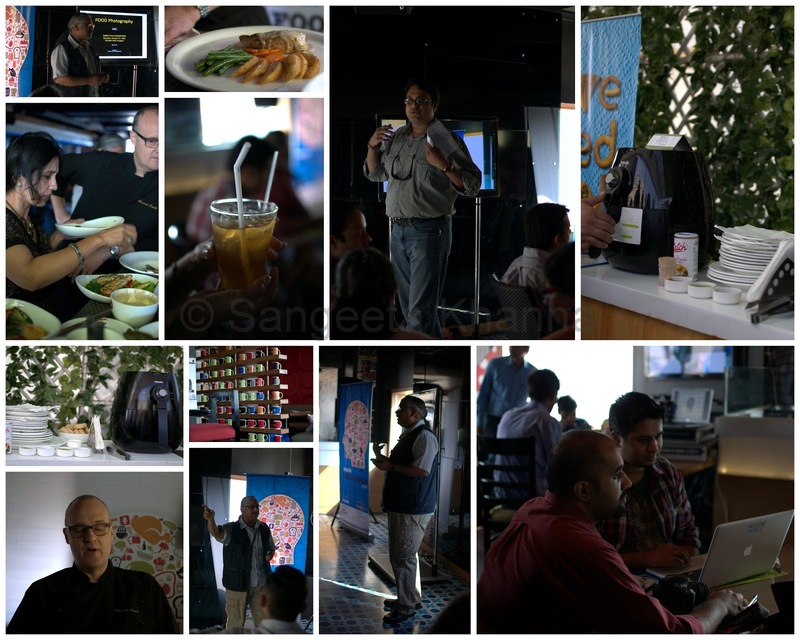 I wish I could enjoy all this learning in a good way as the Cafe V, the venue partners were plain simple apathetic to the event. The cafe is small and there were more invitees than it could hold. I wish the beautifully planned event was executed well so we bloggers could take home some good moments. If the bloggers are invited at a place for four hours and the basics in hospitality are not taken care of, it becomes really difficult to engage in a stimulating discussion that was going on. What I felt, there should have been comfortable seating for everyone so we could listen to things being discussed. I would expect a bottle of water at every table so one doesn't have to depend on apathetic servers (as V Cafe unfortunately had) for basics like water. We were handed out a nice file with itinerary and some loose sheets with pen, a place to sit and note down the tidbits that we learned could have been better. For example, only about a dozen people could hear what Chef Darren was speaking. Everyone else could not be accommodated around the small dais he was speaking from. The star of the event was the Air fryer by Philips. Demonstrations were done, some chicken tikka, potato fries and aloo tikki was air fried in front of us and the results were nice. One would like to have this gadget at home to enjoy nice crisp fries without frying. The pleasant surprise that we got there was that Deeba participated in a food plating contest and won herself a Air fryer for herself. I got to know this fryer bakes some nice cupcakes as well. May be Deeba bakes something in this air fryer and we see her posts soon..
A good experience overall but I would expect such events to be organised in a better way. Especially when the organisers are putting in a lot of creative energy in bringing such good things together. I would repeatedly want to attend such events that discuss about blogger's interests apart from displaying products, but would be glad if the venue is a bit conducive of such good ideas. I would like to add that events with a clear message of brand promotion should be titled such and not call bloggers under different pretext, of a blogging event!! I agree Sangeeta. It was an event packed with 'knowledge', and possibly it was a venue that didn't match the event. However, as you said, I too took back loads from it, and was happy I could attend at least half. I liked the way u posted the pics...how do u do them sweetie, do lemme know. everything in picasa lady. Will tell you the simple steps.